E-Jets E2 Program Wins Aviation Week Commercial Aviation Grand Laureate. 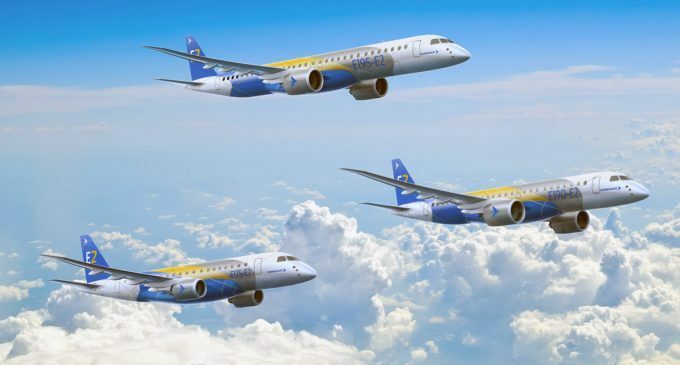 During Aviation Week 2019 Commercial Aviation event ceremony in Washington Embraer’s family of E-Jets E2s has received the Grand Laureate, as well as the Laureates Award in the commercial aircraft platform category. “Though it looks similar to Embraer’s original E-Jet series, the manufacturer’s E2 airliner family is substantially a new design, with major advances in aerodynamics, propulsion, avionics, flight controls and cabin defining a new benchmark for crossover jets,” explained the publication to award the E2 program. “This award belongs to all 18,000 Embraer employees. We must, of course, recognize the greatness of our engineering teams which worked very hard to overcome all the challenges during the E2 program’s development. It’s truly an honor to receive this award in the same year that Embraer is celebrating its 50th anniversary,” said Paulo Cesar de Souza e Silva, Embraer President & CEO. Since its inception, Aviation Week’s Laureate Awards have honored extraordinary achievements in aerospace. Innovators that represent the values and vision of the global aerospace community have changed the way people work and move through the world. Aviation Week continues to recognize the very best accomplishments in the four pillars of our industry: Defense, Commercial Aviation, Space and Business Aviation. Embraer launched its E-Jets E2 program in 2013. The new-generation E-Jets family of commercial aircraft is comprised of three new airplanes – E175-E2, E190-E2, E195-E2 – seating from 70 to 146 passengers. The E-Jets E2s represent the best of new technology in a proven platform. The application of advanced technologies for engines, wings, and avionics sets the E2s apart by providing airlines with the most efficient aircraft in the category while maintaining commonality with E-Jets first-generation. Enhancements include new aerodynamically-advanced high-aspect ratio distinctively-shaped wings, improved systems and avionics, 4th generation full fly-by-wire flight controls, and Pratt &Whitney’s GTFTM high by-pass ratio engines (PW1700G on the E175-E2, PW1900G on the E190-E2 and E195-E2). These combine to generate the most efficient single-aisle family with double-digit reductions in fuel consumption, emissions, noise, and maintenance costs, as well greater productivity through less scheduled maintenance downtime. E-Jets E2s will achieve similar costs per seat as larger re-engined narrow-body aircraft, but with significantly lower costs per trip. In April 2018, Embraer delivered its first E190-E2 to Norway’s Widerøe, Scandinavia’s largest regional airline.